It's sunday again! The weeks just fly by.. I feel like it's only a couple of days ago that I posted my last In My Mailbox. I got a couple of books in this week and I'm very excited to read these, so I wanted to share them with you! For more information about the meme In My Mailbox, check out The Story Siren. 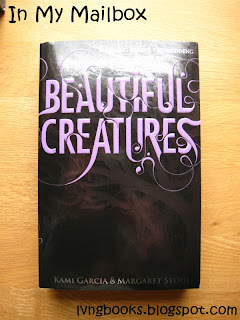 Beautiful Creatures by Kami Garcia and Margaret Stohl. I've heard great things about Beautiful Creatures and Beautiful Darkness so I'm very excited to have this book now. This is what it says on the backside: "In Ethan Wate's hometown there lies the darkest of secrets... There is a girl. Slowly, she pulled the hood from her head... Green eyes, black hair. Lena Duchannes. There is a curse. On the sixteenth moon, of the sixteenth year, the book will take what it's been promised. And no one can stop it. In the end, there is a grave. Lena and Ethan become bound together by a deep, powerful love. But Lena is cursed and, on her sixteenth birthday, her fate will be decided. Ethan never even saw it coming. 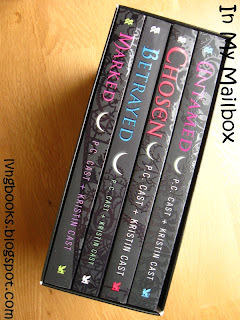 House of Night box set 1 - 4 by P.C. Cast and Kristin Cast. I'm late to the party, I know.. Amazon had this for 50% off on Black Friday so I thought it would be a great moment to pick this box up! It cost me only $ 18 plus shipping so I think that's a nice deal. 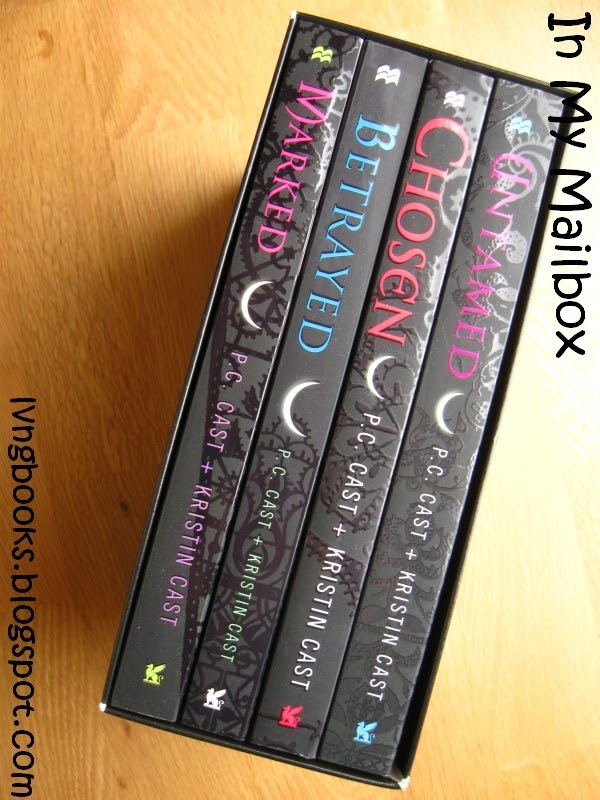 The box holds the first four books: Marked, Betrayed, Hunted and Untamed. 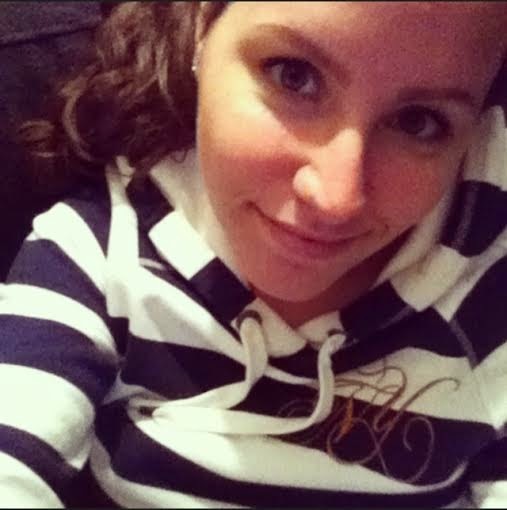 Blogger turned my picture on the side and I don't know how to turn it on the right side? Help! Anyway, it holds the first four books as you can see. I think there are like four more books in the series now so I better get reading haha! And last, but certainly not least: Need by Carrie Jones. This is the first book of the series. 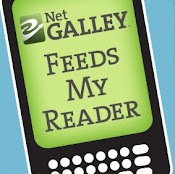 I heard about Captivate and Entice and that's how I discovered Need, too. From the backside of the book: Pain shoots through my head. Fireworks. Explosions. All inside my brain. The white world goes dark and I know what's about to happen. Zara White suspects a freaky guy is stalking her. She memorises phobias and chants them when she's nervous. OK, she hasn't exactly been herself since her stepfather died. But moving to a freezing Maine town to stay with her grandmother is supposed to be the perfect fix - so her mum says. Except, this plan of sending Zara away to help her stay sane? Yeah, not working. Turns out the stalker is not a figment of Zara's imagination. He's still following her, leaving behind an eerie trail of gold dust. There's something not right - not human - in this sleepy Maine town, and all signs are pointing to Zara. I'm really looking forward to reading all of these! The only problem is that I don't have any more room in my bookcloset.. Uh oh! Gotta find a solution for that.. This was all that I got in my mailbox this week, what did you get in yours? 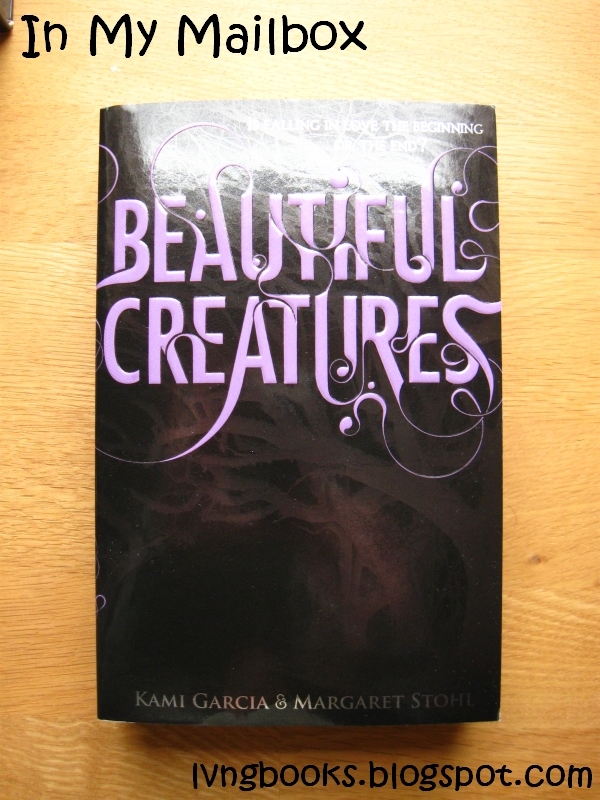 I have Beautiful Creatures on my TBR pile, I have had it for a while now and can't wait to start reading it! I hope you enjoy it. 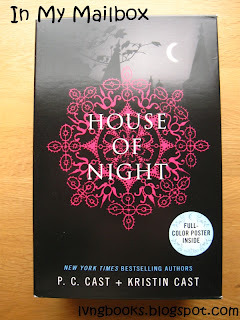 I didn't like The House of Night series, but I've seen a lot of people loving them, so I hope you like those too! Great books this week! 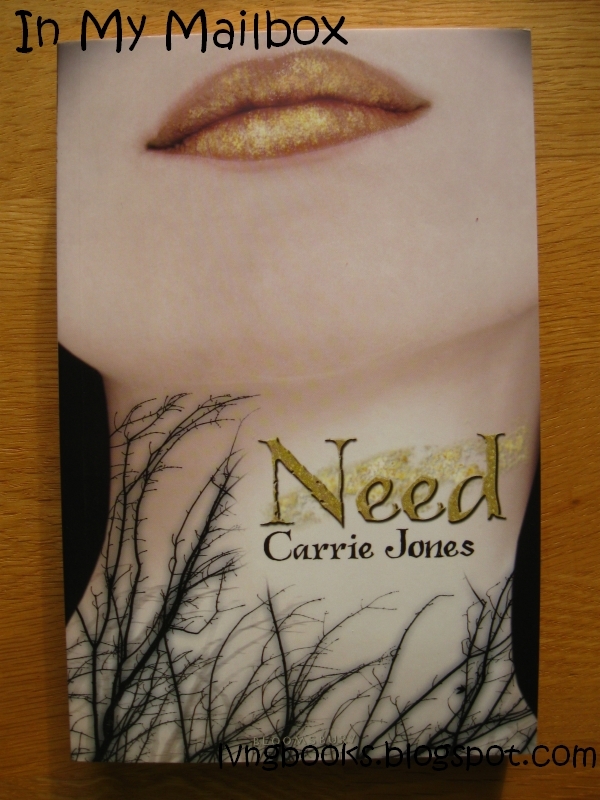 I haven't read the Carrie Jones Need series yet, but I've heard good things. Happy reading! Thanks Amber! Hopefully I'll like the House of Night series, too bad it wasn't for you..
You got some great books. I have read and enjoyed all of them. My YA mailbox is here. Happy reading! Very nice loot to read, enjoy! You got great books this week! I really enjoyed Beautiful Creatures and I have the Carrie Jones series on my list, I'm really looking forward to those:) Enjoy all your books! Great books! I'd like to read the House of Night books. And I love Beautiful Creatures. Thanks Jenny and Alison! I think I'll be good for a couple of weeks haha! Great book :) Beautiful Creatures was amazing, so I hope you enjoy it! Thanks Alice :) I read you gave it 5/5 so now I'm REALLY curious to read the story. Very cool books! I've got both Beautiful Creatures and Beautiful Darkness in my TBR pile. Hope you enjoy all your books! Louise Rennison won the Roald Dahl Funny Prize!